Field pea markets might still be depressed following last year’s trade disputes with India, but the crop represents an opportunity for Manitoba producers in the long term. That’s according to Terry Buss, farm production extension specialist for Manitoba Agriculture. “As you go west and south in Manitoba, the soils are lighter and better drained, and weather and rainfall patterns are such that these areas are better adapted to field peas than soybeans,” said Buss, speaking at this year’s Manitoba Crop Diagnostic School in Carman. And increased processing capacity in Western Canada — starting with Roquette’s planned pea-processing facility in Portage la Prairie — signals new options on the horizon for marketing peas as an ingredient in fibre and protein food products. “Long term, everybody in the business is optimistic about what field peas are going to do,” said Buss in an interview. The biggest difference between field peas and soybeans, said Buss, is that field peas have an accelerated growing season relative to soybeans. “Sometimes I find that new growers are not used to the accelerated timeline with field peas,” he said. This matters particularly early in the season. Field peas have to have a good start in order to capture their full yield potential, said Buss. This means starting with good seed; damaged seed is susceptible to disease infection and seed quality can be impacted by a host of issues from delayed harvest to seed moisture content. Producers should have seed tested by an accredited laboratory for seed quality and germination. This also means getting seeding rates right, at seven or eight plants per square foot, to hit the balance between minimizing humidity in the canopy and capturing yield potential. And even more so than with soybeans, it means scouting early and often, said Buss. 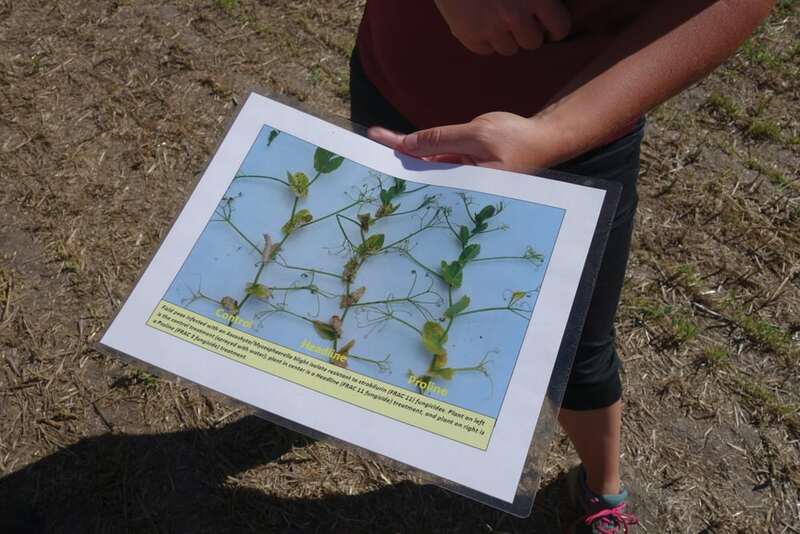 Mycosphaerella blight, more commonly known as ascochyta blight, is the biggest disease of field peas. Soil-borne, it can persist in trash and produce spores that travel long distances. Whether ascochyta becomes a problem comes down to temperature and moisture conditions. The best way to stay on top of ascochyta is to scout four locations within a field every three to five days in the late vegetative stages, from V10 to bloom, and spray a foliar fungicide when necessary to hold the disease down the canopy, Buss said during his presentation. Producers should be looking for characteristic purple “freckles” on the leaves and stems, which are early signs of the disease. Spraying usually occurs around the onset of flowering. In heavy disease years, producers should consider making a second fungicide application 10 to 14 days after the first if conditions stay conducive to disease development. But because this disease is so weather dependent, producers don’t always have to spray if conditions are dry. Buss said soy has fewer disease problems than field peas because the crop is younger, and that it can compensate for losses on the stand density side. Though field peas are more finicky, aggressive management early on can reward producers with a strong crop. “A lot of what we can do with field peas is in that first few weeks of growing them — seed quality, seeding rate, weed control, all of these things help make a crop that’s really healthy and banging along, and then disease is less of an issue,” he said. Will you serve on the board?